Double Entry & Dual Access | EGA Products, Inc.
Born out of the basic concept of ample access, dual access work platforms are indicative of the industrial stair market. Work demands dictate the conceptualization of effective access equipment – in this case, that means access on two sides. Double entry & dual access rolling ladder platforms offer strength and stability in the most demanding of work environments. Some of the most strenuous work is made easier – and safer – with the use of EGA Products mobile work platforms. 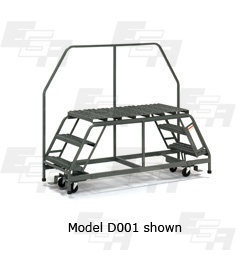 These mobile rolling platforms have a set of stairs on each side to go with a customizable shape to suit specific industrial operations and specific manufacturing and cleaning processes. MADE IN USA – EGA Products is a world-class manufacturer of American Made rolling stairs, ladder platforms and more to tackle the most demanding industrial environments. 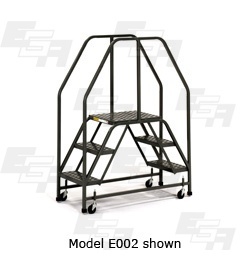 Every item in the EGA product line, big or small, has been conceived through the specific needs of many industries. Warehouse ladders, dock ladders, work platforms, step stools, and more have been sourced through a design to suit mentality. SOLUTION CRITERIA – Customized solutions are what sets EGA apart. Where other competitors in the same space import their materials and some of their products, EGA has remained steadfast in their pursuit of a fully American made product line. This not only enables the best quality goods but also enables the ability to design and build on-demand and as needed. Some items are so popular, they are in stock and can ship the next business day. On the opposite spectrum, other items are designed and built for one client, one time. At EGA, it’s all about client problems being solved the right way. THE CRAFTSMAN’S EYE – At EGA Products, hiring the best welders, machinists, and skilled tradesmen has paid off. In a world dominated by importers, EGA has held its own because it doubled down on a strategy to offer completely American Made material handling goods. Why? It matters to EGA, and it matters even more to their customers. Customers of EGA know they’re buying handcrafted goods they can count on because at EGA having an eye for craftsmanship is why we’re still here today.